+Plastic Electronics provides unrivalled insight for the fast-moving printable, flexible, and organic electronics industry throughout the year. Visit +Plastic Electronics for more information and to subscribe. New printed electronic touchscreen to enable flexible displays A partnership between materials supplier C3Nano and Japanese firm Nissha Printing has developed a transparent conductive film (TCF) for commercial flexible display products. 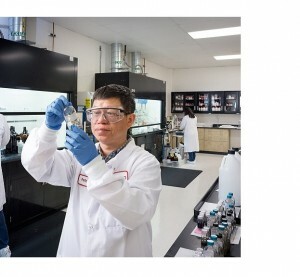 The firms have jointly developed next-generation silver nanowire (AgNW) transparent inks, powered by C3Nano’s ActiveGrid technology. The two companies are developing and testing technologies to ensure the environmental durability of silver nanowire-based transparent inks, for commercial applications of flexible displays. As well as collaborating on the AgNW inks, C3Nano is cooperating with Nissha on the commercial supply of the TCF products. C3Nano delivers its silver nanowire TCF technology to Nissha, which in turn creates the touch sensor components that can be used by manufacturers of phones, tablets, and other consumer electronic devices. Morris explains: ‘We are also working together on high-end flexiblesensors. C3Nano plans to provide the highest performing TCF to Nissha, which will use its exceptional patterning and sensor-fabrication know-how to produce very high quality sensors.’ Central to the TCF’s capability for consumer electronics applications is C3Nano’s proprietary NanoGlue technology, which fuses the AgNW into an effective grid. Morris adds: ‘The net effect lowers sheet resistance while maintaining superior optical transparency. This gives consumer electronics manufacturers the design freedom to work with bendable, flexible formfactors without compromising on the clarity consumers have come to expect in touchscreen displays.’ Silver nanowires C3Nano, a spin-out from Professor Zhenan Bao’s chemical engineering laboratory at Stanford University in the US, has recently invested in commercial supply of AgNW. The company announced the acquisition in April 2015 of Aiden, a South Korean-based producer. In an official statement on the acquisition, Morris stated: ‘This deal positions C3Nano with a global footprint to provide the industry’s highest performing transparent conductive ink at manufacturing volumes. We are at scale today.’ ITO alternatives A variety of firms are seeking to establish their TCF solutions as an alternative to indium tin oxide (ITO) films, the established choice for consumer electronics. 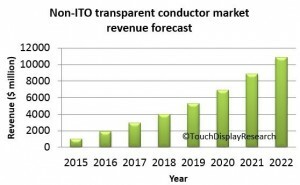 In 2012, consultancy DisplaySearch valued the total touchscreen market was at $12 billion (€10 billion), with ITO dominating. Forecasts suggest there could be greater traction for ITO alternatives in the coming years. 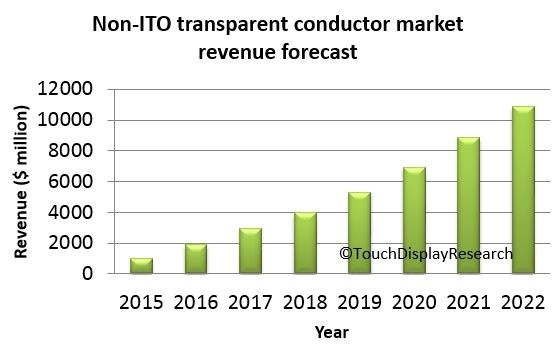 Touch Display Research, a specialist consultancy, forecasts that non-ITO replacement markets will grow from $798 million in 2014 to $8.1 billion in 2021. Display applications can be expected to be a large chunk of this forecasted trend. Alternatives to ITO that have emerged make use of nanomaterials, PEDOT: PSS, and graphene, among other materials. Heraeus is supplying its PEDOT-based solution Clevios for smartphone touchscreen layers on devices in China; and Cambrios’s ClearOhm silver nanowire solution has been used in touch modules since 2011, via a partnership also with Nissha Printing. Flexible displays Morris argues that C3Nano’s technology is well place to take a slice of the ITO alternative market. He notes: ‘Our material is very flexible and is well suited for flexible display applications. Currently, the overall performance is what separates C3Nano’s product from others. This includes low haze, high transparency and sheet resistance of 30-50 Ohms per square. Up until now, there’s been a trade-off between high conductivity and optical performance in ITO replacements.’ The tie-up with Nissha is the second such announcement from C3Nano in 2015. In March, +Plastic Electronics reported that C3Nano and print solutions supplier Kimoto has established a partnership on solution-based TCFs for flexible displays. Kimoto supplies roll-to-roll hard-coated materials for display, touchscreen and automotive markets.